I seem to have a camera roll full of pictures of naked H or blurry pictures of her running. She does not like to slow down or look at the camera! This is the best one I have from all of Memorial Day weekend. We spent 2 afternoons at the pool and H loved it. The first day she wore this Circo bathing suit that I bought her last year. The green straps criss cross in the back and are so cute. Funny story about the chips in her hand. I never let her eat chips, but we ordered some at the pool to share. H waded out into the baby pool to find her cousin, Buba, and took a tumble. Her face went under water, but she raised her arms and saved her chips. She came up laughing, and took another bite. Total frat move. Another thing I have been meaning to mention on the blog for awhile is her swim diaper. I do my best to be environmentally friendly, and we have been using a swim diaper since H was old enough to get in the pool. Traditional disposable swim pants soak up liquid and can become uncomfortable and heavy, not to mention they are expensive and wasteful. A reusable swim diaper is more economical and more comfortable for H. We us a Grovia Hybrid diaper with mesh lining and adjustable snaps. So they same diaper has fit her from about 7 months and will continue to fit her as I adjust the snaps. That suit is so cute! 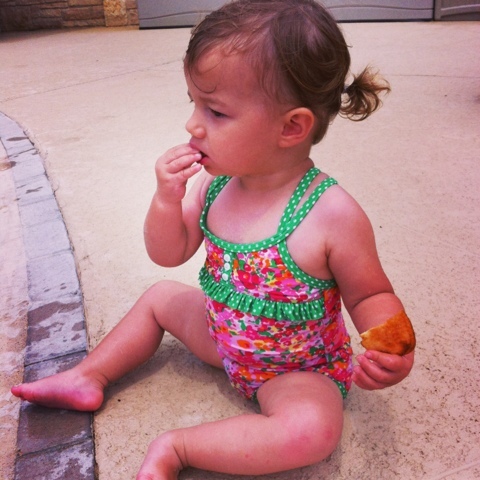 She is so cute nibbling on some food by the pool! Love that suit! H is so cute and love that she saved her chip, woman after my own heart! I want to know more about the diapers!! I hate the disposable water ones! Send me the link and info on what I need for the diapers. I googled GroVia but was overwhelmed by the options for which soaker I needed, etc!